Moorish [ Mooris ] Dance – Really!!! You don’t know who the Moors are. Check out the below take from Wikipedipa with reference to the Morris Dance. You do know that Mooris is a derivative of Moor as well as Moray, Mora, Morisco, Morisques, Moreska, Maurice, Mourice, Maura, Mary, etc. This article is specific to the dance however within it is history regarding the customs and culture of the Moors – check out the picture of the modern europeans trying to claim a history that is NOT theirs. The reason you would not have any information on any dances of England is this is a modern word referencing the English who as defined in the Oxford Dictionary is a hybrid. Morris dance is a form of English folk dance usually accompanied by music. It is based on rhythmic stepping and the execution of choreographed figures by a group of dancers, usually wearing bell pads on their shins. Implements such as sticks, swords and handkerchiefs may also be wielded by the dancers. In a small number of dances for one or two men, steps are performed near and across a pair of clay tobacco pipes laid one across the other on the floor. The earliest known and surviving English written mention of Morris dance is dated to 1448, and records the payment of seven shillings to Morris dancers by the Goldsmiths’ Company in London. Further mentions of morris dancing occur in the late 15th century, and there are also early records such as visiting bishops’ “Visitation Articles” mention sword dancing, guising and other dancing activities, as well as mumming plays. While the earliest records invariably mention “Morys” in a court setting, and a little later in the Lord Mayors’ Processions in London, it had adopted the nature of a folk dance performed in the parishes by the mid 17th century. A small statue of a “Moriskentänzer” made by Erasmus Grasser in 1480 for Old Townhall in Munich, one of a set of 16, of which only 10 remain. This dancer is clearly “moorish“, but all the other 9 surviving carvings have caucasian features. All wear bells on their legs. The name is first recorded in the mid-15th century as Morisk dance, moreys daunce, morisse daunce, i.e. “Moorish dance”. The term entered English via Flemish mooriske danse Comparable terms in other languages are German Moriskentanz (also from the 15th century), French morisques, Croatian moreška, and moresco, moresca or morisca in Italy and Spain. The modern spelling Morris-dance first appears in the 17th century. It is unclear why the dance was so named, “unless in reference to fantastic dancing or costumes”, i.e. the deliberately “exotic” flavour of the performance. The English dance thus apparently arose as part of a wider 15th-century European fashion for supposedly “Moorish” spectacle, which also left traces in Spanish and Italian folk dance. The means and chronology of the transmission of this fashion is now difficult to trace; the Great London Chronicle records “spangled Spanish dancers” performing an energetic dance before Henry VII at Christmas of 1494, but Heron’s accounts also mention “pleying of the mourice dance” four days earlier, and the attestation of the English term from the mid-15th century establishes that there was a “Moorish dance” performed in England decades prior to 1494. It is suggested that the tradition of rural English dancers blackening their faces may be a reference to north African (or Moorish) pirates who settled in England. While the earliest (15th-century) references place the Morris dance in a courtly setting, it appears that the dance became part of performances for the lower classes by the later 16th century; in 1600, the Shakespearean actor William Kempe morris danced from London to Norwich, an event chronicled in his Nine Daies Wonder (1600). Almost nothing is known about the folk dances of England prior to the mid-17th century. While it is possible to speculate on the transition of “morris dancing” from the courtly to a rural setting, it may have acquired elements of pre-Elizabethan (medieval) folk dance, such proposals will always be based on an argument from silence as there is no direct record of what such elements would have looked like. In the Elizabethan period, there was significant cultural contact between Italy and England, and it has been suggested that much of what is now considered traditional English folk dance, and especially English country dance, is descended from Italian dances imported in the 16th century. By the mid 17th century, the working peasantry took part in morris dances, especially at Whitsun.The Puritan government of Oliver Cromwell, however, suppressed Whitsun Ales and other such festivities. When the crown was restored by Charles II, the springtime festivals were restored. In particular, Whitsun Ales came to be celebrated on Whitsunday (Pentecost), as the date coincided with the birthday of Charles II. Morris dancing continued in popularity until the industrial revolution and its accompanying social changes. Four teams claim a continuous lineage[clarification needed] of tradition within their village or town: Abingdon (their morris team was kept going by the Hemmings family), Bampton, Headington Quarry, and Chipping Campden. Other villages have revived their own traditions, and hundreds of other teams across the globe have adopted (and adapted) these traditions, or have created their own styles from the basic building blocks of morris stepping and figures. Several English folklorists were responsible for recording and reviving the tradition in the early 20th century, often from a bare handful of surviving members of mid-19th-century village sides. Among these, the most notable are Cecil Sharp, Maud Karpeles, and Mary Neal. Boxing Day 1899 is widely regarded as the starting point for the morris revival. Cecil Sharp was visiting at a friend’s house in Headington, near Oxford, when the Headington Quarry morris side arrived to perform. Sharp was intrigued by the music and collected several tunes from the side’s musician, William Kimber; not until about a decade later, however, did he begin collecting the dances, spurred and at first assisted by Mary Neal, a founder of the Espérance Club (a dressmaking co-operative and club for young working women in London), and Herbert MacIlwaine, musical director of the Espérance Club. Neal was looking for dances for her girls to perform, and so the first revival performance was by young women in London. In the first few decades of the 20th century, several men’s sides were formed, and in 1934 the Morris Ring was founded by six revival sides. In the 1950s and especially the 1960s, there was an explosion of new dance teams, some of them women’s or mixed sides. At the time, there was often heated debate over the propriety and even legitimacy of women dancing the morris, even though there is evidence as far back as the 16th century that there were female morris dancers. There are now male, female and mixed sides to be found. Partly because women’s and mixed sides are not eligible for full membership of the Morris Ring, two other national (and international) bodies were formed, the Morris Federation and Open Morris. All three bodies provide communication, advice, insurance, instructionals (teaching sessions) and social and dancing opportunities to their members. The three bodies co-operate on some issues, while maintaining their distinct identities. Today, there are six predominant styles of morris dancing, and different dances or traditions within each style named after their region of origin. Cotswold morris: dances from an area mostly in Gloucestershire and Oxfordshire; an established misnomer, since the Cotswolds overlap this region only partially. Normally danced with handkerchiefs or sticks to accompany the hand movements. Dances are usually for 6 or 8 dancers, but solo and duo dances (known as single or double jigs) also occur. North West morris: more military in style and often processional, that developed out of the mills in the North-West of England in the 19th and early 20th centuries. Border Morris from the English-Welsh border: a simpler, looser, more vigorous style, traditionally danced with blackened faces. Longsword dancing from Yorkshire and south Durham, danced with long, rigid metal or wooden swords for, usually, 6 or 8 dancers. Rapper from Northumberland and Co. Durham, danced with short flexible sprung steel swords, usually for 5 dancers. Molly Dancing from Cambridgeshire. Traditionally danced on Plough Monday, they were Feast dances that were danced to collect money during harsh winters. One of the dancers would be dressed as a woman, hence the name. Joseph Needham identified two separate families of Molly dances, one from three villages in the Cambridge area and one from two in the Ely area. Ploughstots (alternatively Vessel Cupping and Plew-ladding) from the East and North ridings of Yorkshire, also danced on Plough Monday. The dancers often held “flags”, used similarly to handkerchiefs in Cotswold and Border dances to emphasise hand movements, or rattling bones, rather than wearing bells but for the same purpose. A similar Plough Monday tradition exists in the East Midlands; some of these dances involve swords, usually danced over in a similar manner to baccapipes jigs from Oxfordshire. Lionel Bacon records Cotswold morris traditions from these villages: Abingdon, Adderbury, Ascot-under-Wychwood, Badby, Bampton, Bidford, Bledington, Brackley, Bucknell, Chipping Campden, Ducklington, Eynsham, Headington Quarry, Hinton-in-the-Hedges, Ilmington, Kirtlington, Leafield, Longborough, Oddington, Sherbourne, Stanton Harcourt, and Wheatley. Bacon also lists the tradition from Lichfield, which is Cotswold-like despite that city’s distance from the Cotswold morris area; the authenticity of this tradition has been questioned. In 2006, a small number of dances from a previously unknown tradition was discovered by Barry Care of Moulton Morris Men (Ravensthorpe, Northants)—two of them danceable. Other dances listed by Bacon include Border morris dances from Brimfield, Bromsberrow Heath, Evesham, Leominster, Much Wenlock, Pershore, Upton-upon-Severn, Upton Snodsbury, White Ladies Aston, and miscellaneous non-Cotswold, non-Border dances from Steeple Claydon and Winster. There are a number of traditions which have been collected since the mid-twentieth century, though few have been widely adopted. Examples are Broadwood, Duns Tew, and Ousington-under-Wash in the Cotswold style, and Upper and Lower Penn in the Border style. In fact, for many of the “collected” traditions in Bacon, only sketchy information is available about the way they were danced in the nineteenth century, and they have been reconstructed to a degree that makes them largely twentieth century inventions as well. Some traditions have been reconstructed in several strikingly disparate ways; an example would be Adderbury, danced very differently by the Adderbury Morris Men and the Adderbury Village Morris. The North West tradition is named after the North West region of England and has always featured mixed and female sides – at least as far back as the 18th century. There is a picture of Eccles Wakes (painted in the 1820s, judging by the style of dress of some of the participants and spectators) that shows both male and female dancers. Historically, most sides danced in various styles of shoes or boots, although dancing in clogs was also very common. Modern revivalist sides have tended more towards the wearing of clogs. The dances were often associated with rushcarts at the local wakes or holidays. The dances themselves were often called ‘maze’ or ‘garland dances’ as they involved a very intricate set of movements in which the dancers wove in and out of each other. Some dances were performed with a wicker hoop (decorated with garlands of flowers) held above the dancer’s head. Some dancers were also associated with a tradition of mumming and hold a pace egging play in their area. The Britannia Coco-nut Dancers, named after a mill not far from Bacup, are unique in the tradition, in that they used sawn bobbins to make a noise, and perform to the accompaniment of a brass ensemble. They are one of the few North West morris groups that still black up their faces. It is said that the dance found its way to the area through Cornishmen who migrated to work in the Rossendale quarries. The term “Border Morris” was first used by E. C. Cawte in a 1963 article on the morris dance traditions of Herefordshire, Shropshire, and Worcestershire – counties along the border with Wales. Characteristics of the tradition as practised in the 19th and early 20th centuries include black painted faces (in some areas); use of either a small strip of bells (in some areas) or no bells at all (in others); costume often consisting of ordinary clothes decorated with ribbons, strips of cloth, or pieces of coloured paper; or sometimes “fancy dress”; small numbers of dances in the team repertoire, often only one and rarely more than two; highly variable number of dancers in the set and configurations of the set (some sides had different versions of a dance for different numbers of dancers); and an emphasis on stick dances almost to the exclusion of hankie dances. Usually regarded as a type of morris, although many of the performers themselves consider it as a traditional dance form in its own right, is the sword dance tradition, which includes both rapper sword and longsword traditions. In both styles the “swords” are not actual swords, but implements specifically made for the dance. The dancers are usually linked one to another via the swords, with one end of each held by one dancer and the other end by another. Rapper sides consist of five dancers, who are permanently linked-up during the dance. The rapper sword is a very flexible strip of spring-steel with a wooden handle at each end. The longsword is about 2’6″ (0.8 metres) long, with a wooden handle at one end, a blunt tip, and no edge. Sometimes ribbons are threaded through a hole in the tip oif the sword, and the dancers grab on to them during the course of the dance. Longsword sides consist usually of five to eight dancers. In both rapper and longsword there is often a supernumerary “character”, who dances around, outside, and inside the set. The English mummers play occasionally involves morris or sword dances either incorporated as part of the play or performed at the same event. Mummers plays are often performed in the streets near Christmas to celebrate the New Year and the coming springtime. In these plays are central themes of death and rebirth. Other forms include Molly dance from Cambridgeshire. Molly dance, which is associated with Plough Monday, is a parodic form danced in work boots and with at least one Molly man dressed as a woman. The largest Molly Dance event is the Whittlesea Straw Bear Festival, established in 1980, held at Whittlesey in Cambridgeshire in January. There is also hoodening which comes from East Kent, and the Abbots Bromley Horn Dance. Another expression of the morris tradition is Vessel Cupping. This was practised in the East Riding of Yorkshire until the 1920s. It was a form danced by itinerant ploughboys in sets of three or four, about the time of Candlemas. Additionally, there is a specifically Welsh version of this terpsichorean art that is distinct from the Borders Morris style. This style is called Nantgarw tradition after a small village in the Taff Valley. One Nantgarw dance, Y Caseg Eira, is derived directly from notes made on traditional Welsh dances from the 1890s. These notes were made by Dr. Ceinwen Thomas in the 1950s from the childhood recollections of her mother, Catherine Margretta Thomas. Others are more modern inventions made in the style of older dances. Dances in the Nantgarw style include; Caseg Eira (The Snow Mare), Hela’r Sgwarnog (Hunting The Hare) and Ty Coch Caerdydd (The Red House of Cardiff). Music was traditionally provided by either a pipe and tabor or a fiddle. These are still used today, but the most common instrument is the melodeon. Accordions and concertinas are also common, and other instruments are sometimes used. Often drums are employed. Cotswold and sword dancers are most often accompanied by a single player, but Northwest and Border sides often have a band, usually including a drum. For Cotswold and (to a degree) Border dances, the tunes are traditional and specific: the name of the dance is often actually the name of the tune, and dances of the same name from different traditions will have slightly different tunes. For Northwest and sword dancing there is less often a specific tune for a dance: the players may use several tunes, and will often change tunes during a dance. For dances which have set tunes, there is often a short song set to the tune. This is sung by the musician(s) or by the whole side as an introduction to the tune before the dance. The songs are usually rural in focus (i.e. related to agricultural practices or village life) and often bawdy or vulgar. Songs for some dances vary from side to side, and some sides omit songs altogether. Several notable albums have been released, in particular the Morris On series, which consists of Morris On, Son of Morris On, Grandson of Morris On, Great Grandson of Morris On, Morris On the Road, and Mother of all Morris. Like many activities, morris dancing has a range of words and phrases that it uses in special ways. Many participants will refer to the world of morris dancing as a whole as the morris. A morris troupe is usually referred to as a side or a team. The two terms are interchangeable. Despite the terminology, morris dancing is hardly ever competitive. A set (which can also be referred to as a side) is a number of dancers in a particular arrangement for a dance. Most Cotswold morris dances are danced in a rectangular set of six dancers, and most Northwest dances in a rectangular set of eight; but there are many exceptions. A jig is a dance performed by one (or sometimes two) dancers, rather than by a set. Its music does not usually have the rhythm implied by the word jig in other contexts. The role of the squire varies. In some sides the squire is the leader, who will speak for the side in public, usually lead or call the dances, and often decide the programme for a performance. In other sides the squire is more of an administrator, with the foreman taking the lead, and the dances called by any experienced dancer. The foreman teaches and trains the dancers, and is responsible for the style and standard of the side’s dancing. The foreman is often “active” with the “passive” dancers. The bagman is traditionally the keeper of the bag—that is to say, the side’s funds and equipment. In some sides today the bagman acts as secretary (particularly bookings secretary) and there is often a separate treasurer. On some sides a ragman manages and co-ordinates the team’s kit or costume. This may include making bell-pads, ribbon bads, sashes and other accoutrements. Many sides have one or more fools. A fool will usually be extravagantly dressed, and communicate directly with the audience in speech or mime. The fool will often dance around and even through a dance without appearing really to be a part of it, but it takes a talented dancer to pull off such fooling while actually adding to and not distracting from the main dance set. Many sides also have a beast: a dancer in a costume made to look like a real or mythical animal. Beasts mainly interact with the audience, particularly children. In some groups this dancer is called the hobby. A tradition in Cotswold morris is a collection of dances that come from a particular area, and have something in common: usually the steps, arm movements, and dance figures. Many newer traditions are invented by revival teams. Most Cotswold dances alternate common figures (or just figures) with a distinctive figure (or chorus). The common figures are common to all (or some) dances in the tradition; the distinctive figure distinguishes that dance from others in the same tradition. Sometimes (particularly in corner dances) the choruses are not identical, but have their own sequence specific to the tradition. Nevertheless, something about the way the chorus is danced will distinguish that dance from others. Several traditions will often have essentially the same dance, where the name, tune, and distinctive figure are the same or similar, but each tradition employs its common figures and style. In England, an ale is a private party where a number of morris sides get together and perform dances for their own enjoyment rather than for an audience. Food is usually supplied, and sometimes this is a formal meal known as a feast or ale-feast. Occasionally an evening ale will be combined with a day or weekend of dance, where all the invited sides will tour the area and perform in public. In North America the term is widely used to describe a full weekend of dancing involving public performances and sometimes workshops. In the sixteenth to nineteenth centuries, the term “ale” referred to a church- or village-sponsored event where ale or beer was sold to raise funds. Morris dancers were often employed at such events. The “soul” of morris dancing exists within many individual groups, which are for the most part constituted as autonomous clubs or sides, each with its own constitution and procedures. Sides do not exist in isolation, and generally co-exist in a spirit of good-will and meet regularly, not just at large Folk Festivals or meetings organised by the three national umbrella organisations (Ring, Federation and Open), but also at annual Feasts or Ales that many sides organise. Apart from copious amounts of drinking and eating, these events (which can run over a whole weekend) are an opportunity for large numbers of morris dancers and musicians from across the country to come together in massed ensembles, performing throughout the area covered by the host side. In theory, sides may acknowledge geographic rights of others, although, except in very unusual cases, there is actually nothing to stop one side performing in the heartland of another. In the past this may have rarely been done without permission and agreement, but in modern practice such courtesies are mainly taken for granted. In most cases, sides partner each other via a system of mutual invitations at Morris Dancing venues. Morris dancing is now an art and recreation enjoyed by men and women across the world. In England, there are many Mixed Morris sides that enable people to dance and have roles irrespective of gender. The continuance of the morris is as much in the hands of independent groups of enthusiasts as it is in the nationwide groupings such as The Morris Ring or The Morris Federation. So while for some sides there is a feeling that the music and dance recorded in the 19th century should be maintained, there are others who freely reinterpret the music and dance to suit their abilities and including modern influences. In 2008 a front page article in the Independent Magazine noted the rising influence of neopaganism within the modern morris tradition. The article featured the views of Neopagan sides Wolf’s Head and Vixen Morris and Hunter’s Moon Morris and contrasted them with those of the more traditional Long Man Morris Men. Conversely, the Telegraph carried a report on 5 January 2009, predicting the demise of morris dancing within 20 years, due to the lack of young people willing to take part. This widespread story originated from a senior member of the more traditionally-minded Morris Ring, and may only reflect the situation in relation to member groups of that one organization. The success of Terry Pratchett‘s Discworld novels has seen the entirely invented Dark Morris tradition being brought to life in some form by genuine morris sides such as the Witchmen Morris and Jack Frost Morris. The advent of the Internet in the 1990s has also given Morris sides a new platform upon which to perform. 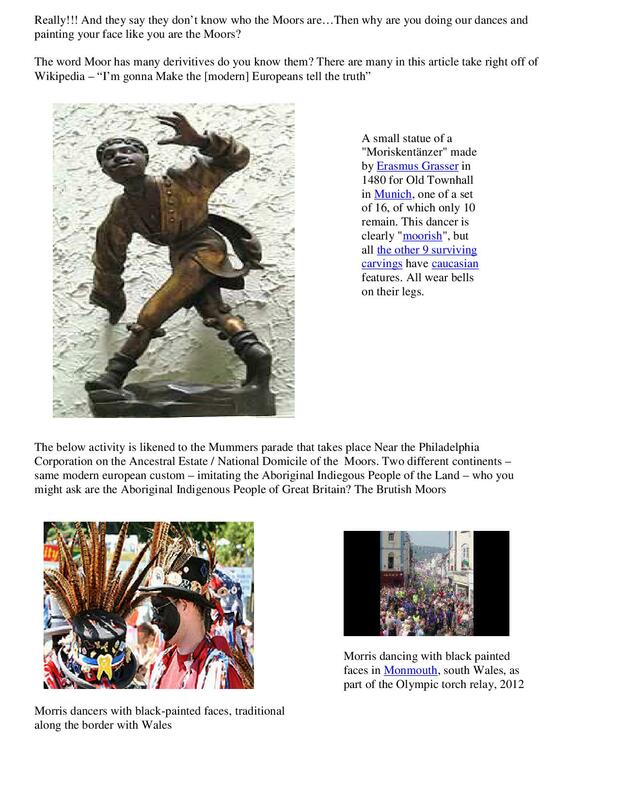 Many Morris sides now have entertaining websites which seek to reflect the public persona of the individual sides as much as record their exploits and list forthcoming performances. There are also a multitude of thriving Morris related blogs, forums and individual sides are to be found maintaining an interactive presence on major social networking sites. There is great variety shown in how morris sides dress, from the predominantly white clothing of Cotswold sides to the tattered jackets worn by Border teams. Some common items of clothing are: bellpads; baldrics; rosettes; waistcoats; tatter-coats; knee-length breeches; wooden clogs; straw hats, top hats, or bowlers; neckerchiefs; armbands. The dance may have given name to the board games three men’s morris, six men’s morris and nine men’s morris. Erasmus Grasser, a German sculptor, created 16 realistic animated wooden figures in the late 15th century called the morris dancers. Two ships named Morris Dance have served in the Royal Navy in the 20th Century.